Bring your ear plugs...grab your tent...and get ready! 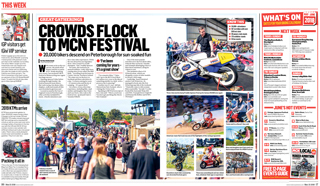 The Carole Nash MCN Festival of Motorcycling kicks off 13-14 May at the East of England Arena and offers two days of fantastic biking entertainment. Watch as Chris 'Stalker' Walker takes to the dirt in the gripping Hooligan dirt track racing, plus watch a full round of Speedway Championships* (FREE to campers) as the Panthers take on the Diamonds. At the heart of the festival is the opportunity to throw a leg over the latest 2017 machines, plus you can soak up the atmosphere with jaw-dropping stunts and fire-ups, massive autojumble and club displays, get hordes of kit and accessories at great show offers plus enjoy the great refreshments on offer. Join us for the day for only £15 or camp for the weekend £35. Kids under 15 go free. Get 50p of 29th March issue of MCN - just complete the form below and print your voucher.